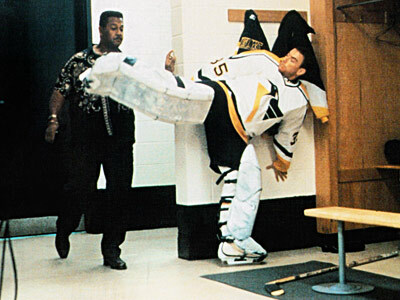 Darren McCord (Van Damme) is a sort of down-on-his-luck ex-firefighter from Pittsburgh. To help show he’s a good dad, he takes his two kids, Tyler and Emily (Malinger and Wright) to see their beloved Penguins play the Chicago Blackhawks in a big hockey game for the Stanley Cup. As it turns out, the Vice President of the United States (Barry) is also a big hockey fan and in attendance, and a gang of baddies led by the maniacal but smooth Joshua Foss (Boothe) threaten to kill the Vice-Prez, and blow up the arena with all 17,000 people inside if they don’t get the money they’re asking for. As if that wasn’t enough, they’ve kidnapped Emily and are holding her with the other hostages in one of the luxury boxes. And Hallmark (Harewood) of the secret service doesn’t seem to be of much help. So it’s up to Darren McCord to try and dismantle all the bombs, save his family, save the Vice-Prez, save the hockey fans, and stop Foss - all single-handedly. Can he do it? The now-classic 90’s theme of “DieHardInA” movies is perhaps never better exemplified than here. Tired of accented and/or quirky baddies over-running water treatment plants, biochemical weapons labs, schools, hotels, train tunnels, malls, planes, dams, rock concerts, computer research facilities, buildings, Beverly Hillses, more buildings, and beauty contests (Lethal Tender , Deadly Outbreak, Detention, Crackerjack, Crackerjack 2, Irresistible Force, Strategic Command, Terminal Rush, Command Performance, Virtual Assassin, The Alternate, The Taking of Beverly Hills, The Last Hour, Open Fire and No Contest, respectively), this time they try a hockey rink. Powers Boothe steals the show as the evildoer who looks like a dapper Oliver Stone. The whole thing is very competently and professionally directed, and it’s standard action fare for the most part, with a few standout scenes and creatively-staged deaths that help endear the movie to the audience. The fact that it’s the Vice President that’s in trouble certainly threw us for a loop. But then again, what does the Vice President do, anyway? That’s why it’s good that Van Damme had kids (and an arena of self-described “Puckheads”) to save, because if they had shot the VP, those stakes just aren’t high enough. Also, it’s good that they were able to get real teams, players, announcers and staff. That added some nice realism, instead of some made-up team like the Pittsburgh....Powers or something. (Though Boothe surely would have enjoyed that). Plus you know one of the baddies is evil because he has a “terrorist earring”, and what we dubbed “evil popcorn” makes an appearance. Because it was the 90’s, there are some great fashions on display, a character is playing Doom on a PC, Tyler has a mini Super Soaker, and McCord’s son is named Tyler. It’s a totally 90’s name (heh heh). There was a time, not so long ago, that movies like this went to the theater. It seems hard to believe, but it’s true. 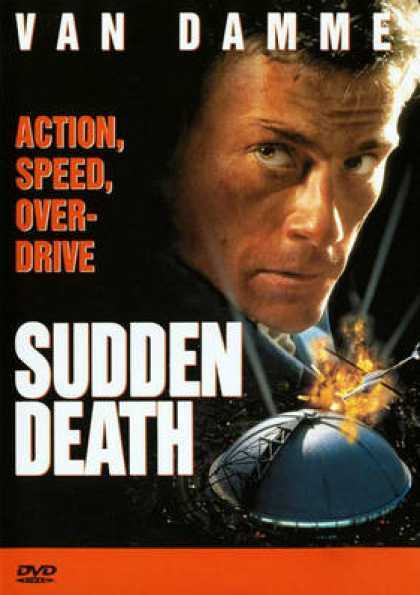 Sudden Death is certainly enjoyable, and will remind you of the action boom of the 90’s right before it all went DTV. Also check out write-ups by our buddies: The Video Vacuum, The Action Elite, and Exploding Helicopter! I actually saw this movie in a theater, in Studio in Helsinki. The theater is long gone by now, but I still remember the movies I watched there and the aquarium in the lobby. Using a hockey rink was a great way of setting this movie apart from all the other DieHardInA movies. Great movie and great review as always, Ty and Brett! Thanks for the kind words, Roger! That is really cool you saw this in the theater too! Sudden Death is a blast to watch with friends. Sudden Death is one of my favourite JCVD films. It's got classy production values and it pulls off a difficult trick of being serious but also silly - the penalty puck save, the penguin fight, etc. At the end of the day it is unashamedly 'an entertainment' as I believe Alfred Hitchcock used to call his films. As you say there's some good inventiveness in this film especially - I'm pleased to say - in one of the helicopter explosions. Nice review and thanks for the plug. You're welcome about the plug! Happy to do it. Can't agree more...Sudden Death is pure fun throughout most of the running time. The penguin fight is really funny and brilliant at the same time. 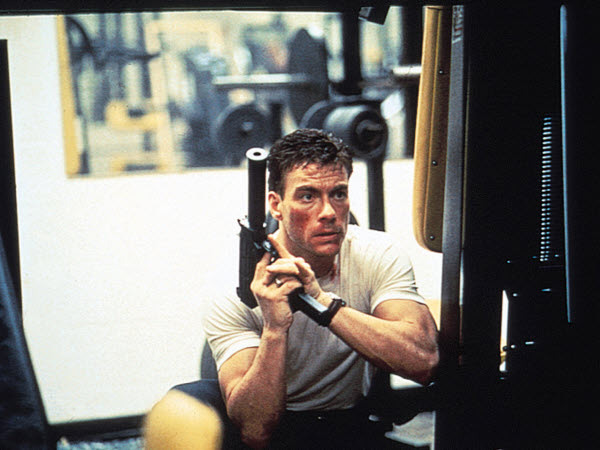 great review and an underrated van damme classic. slick action and Powers Boothe steals the show. and thanks for the awesome list of 90s Die Hard clones: No Contest - best Die Hard set at a beauty contest film ever! Thanks! You're welcome about the list! Sudden Death is just great. Classic Van Dammage. Haha, gotta love No Contest...Andrew Dice Clay and Shannon Tweed doing martial arts.